"White deer green ox welcome Taoism Chariot, Feather clothes Ivory talbets perform court rituals." "His majesty was received warmly by white deer and green ox. Rituals in his honor were attended by people in feather clothes with ivory tablets in their hands." In the couplet was the story about Laozi's visit to Han Gu Pass. 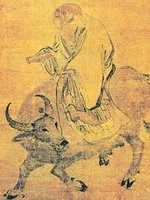 In this story, the 'green ox' was mounted by Laozi, which, in the couplet, reminded of Book of Tao and its Virtue, the book Laozi wrote at that spot. In Daoist stories, immortals used to appear in 'feather clothes', which, in this case, became the symbol of Laozi's ascension to the heaven. The author of the couplet used 'rituals' in the second sentence to suggest the homage and respect paid to Laozi by Daoist followers and relevant Daoist services in the later periods. In most Daoist Grotto Heavens and Blissful Realms, we can easily find couplets like this. "Pine Juniper hidden perch Three Islands Crane, Temple pagoda closed lock Nine Heaven Cloud"
"The pine trees invite the cranes from the Three Islands, the buildings harbor clouds from the highest heaven". In this case, the couplet detailed the natural beauty of Zhuhe Mansion, the cranes flying above the pine trees and their singing echoing in the high mountains around it. The natural beauty, however, produced a frame of mind, i.e., the Daoist refinement of inner nature. In this regard, 'the three islands' referred to Penglai, Fangzhan and Yingzhou, the fairylands described in ancient Daoist mythical stories as perfect spots for cultivation. The combination of mystery from mythical and religious stories and the beauty of nature helped to create intangible beauty as well as a unique atmosphere associated with Daoist culture highlighting immortals, Grotto Heavens and Blissful Lands, which, in return, provided the visitors with a chance to experience spiritual uplift. 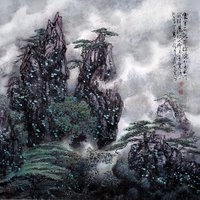 In Daoist couplets lay not only Daoist understandings about nature and the human world, but also unique aesthetic tastes, which explained why Daoists and literati showed so much interest in composing couplets that injected humanity into Daoist culture.